Look at the words in the question. These are the concepts you must respond to and weave throughout your answer – but that does not mean simply repeating the words superficially at the end of each paragraph. You need to demonstrate that you’ve thought about and gotten to grips with the meat and substance of the theme, issue or character you’re discussing. HOW / WHY does this character deal with this issue? Are there any SCENES which deal with this issue specifically? This is just ONE WAY TO APPROACH formulating an answer to this question – there is no right way to do it, just many different options, but I find this a useful set of questions to ask myself when planning an answer, regardless of the theme I’m exploring. Shakespeare’s “King Lear” dramatically explores the concept of justice & presents a frightening vision of what happens in a society when those who control the justice system are cruel & corrupt. The word ‘justice’ refers to the idea that we are fair and reasonable in our dealings with others. As a society we expect those who commit crimes to be punished because we value the idea of justice. In fact, many of our religious beliefs are based on the idea of divine justice – that God will reward good and punish evil. In this play, first Lear & then Regan & Goneril control the country & therefore the justice system. Their corruption seeps into every crevice of this society through the extreme and arbitrary punishments they mete out to those they feel have wronged them. Edmund also gains power & so he too becomes involved in handing out justice in this play. Shakespeare’s “King Lear” dramatically explores the concept of justice & presents a frightening vision of what happens in a society when those who control the justice system are cruel & corrupt. The word ‘justice’ refers to the idea that we are fair and reasonable in our dealings with others. As a society we expect those who commit crimes to be punished because we value the idea of justice. In fact, many of our religious beliefs are based on the idea of divine justice – that God will reward good and punish evil. In this play, first Lear & then Regan & Goneril control the country & therefore the justice system. Their corruption seeps into every crevice of this society through the extreme and arbitrary punishments they mete out to those they feel have wronged them. Edmund also gains power & so he too becomes involved in handing out justice in this play. PARAGRAPH 1: Show how this issue is revealed at the beginning of the play. DO NOT TELL THE STORY, you can assume the examiner knows the plot. Lear, as King, begins the play completely in charge of handing out justice to his citizens. He is tired of this responsibility and intends to “shake all cares and business from our age conferring them on younger strengths”. However he wishes to “retain the name and all the addition to a king”. The very idea seems to challenge our concept of justice and fairness – why should he have the status and privilege of being King if he is not also going to do the hard work? PARAGRAPH 2: continue discussion of LEAR. DO NOT TELL THE STORY. In the process of handing over his kingdom to his daughters, a serious miscarriage of justice occurs. 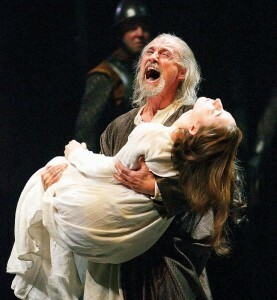 Lear banishes his daughter Cordelia because she “cannot heave [her] heart into [her] mouth” and then banishes his loyal servant Kent for daring to challenge the wisdom of this decision (“come not between the dragon and his wrath”). Kent refuses to back down because he can see that their justice system is completely corrupt if a person can be banished (without trial) for speaking the truth. Similarly, Gloucester declares Edgar guilty of plotting to murder him without offering his son a fair hearing and thus a second miscarriage of justice occurs. PARAGRAPH 3: move on to discuss other characters that personify this issue. DO NOT TELL THE STORY. Once Goneril & Regan gain power, they destroy any remaining semblance of justice or fairness in this society. They put Kent in the stocks, strip Lear of his knights (“what need one?”) and shut him out in the storm (“lock up your doors”) all because he requested a little luxury in his old age (“allow not nature more than nature needs, man’s life’s as cheap as beasts”). Here we see that they are disregarding one of the most basic concepts of justice – that the punishment should fit the crime. Many of us find our parents annoying at times but we don’t strip them of their final penny & throw them out onto the streets. Lear himself refers to this idea later in the play when he recognises his mistakes but claims he is “a man more sinned against than sinning”. He later realises and regrets that as King he neglected his duty to provide social justice for the poor in his kingdom “poor naked wretches that bide the pelting of the pitiless storm. Oh I have taken too little care of this”. He also accepts that he has failed to administer justice fairly saying of Cordelia “I did her wrong”. Thus we see his concept of justice maturing and developing over the course of the play and the vanity and corruption which defined him in the early stages of the play giving way to a nobility of character, gained through suffering. PARAGRAPH 4: Now move onto another character who is significant in discussing this issue. DO NOT TELL THE STORY. Edmund is also central to any discussion of justice in the play. He feels that the society and the law discriminates against illegitimate children “why brand they us with base? with baseness? Bastardy?” particularly in the area of inheritance. If he does nothing, he will be left with nothing “legitimate Edgar I must have your land” and so he comes up with a plan to get ’justice’ of a kind for himself. Although we feel a certain measure of sympathy and admiration for him we cannot support his version of ’justice’ because it is not true justice – it involves destroying innocent people in order to get what he wants. During the play two key ‘trials’ occur which dramatically explore the theme of justice. Firstly, Lear holds a mock trial of his eldest daughters asking “is there any cause in nature that make these hard hearts?”. He appoints Poor Tom and the Fool as the judges, thus mocking the idea of justice by suggesting that fools and madmen control the justice system. Secondly Gloucester is put on trial after Edmund reveals to Goneril & Regan that his father has been assisting Lear and that a French army led by Cordelia is going to invade in an attempt to restore Lear to power. Enraged, they declare him guilty of consorting with the enemy and as punishment for being a ‘traitor’ they “pluck out his eyes”. At this point it is graphically clear that if those in power are corrupt, they can completely destroy any notion of true justice in a society. PARAGRAPH 6: What final impression are we left with of this issue? DO NOT TELL THE STORY. At the end of the play we are left with the sense that justice has completely failed in this society. Lear and Cordelia are captured, imprisoned and then Cordelia is killed on Edmund’s orders. Even though he makes a deathbed attempt to save her (“some good I mean to do in spite of mine own nature”), his gesture comes too late. We do feel it is right and just that Edgar is the one to fatally wound Edmund, but this is revenge not true justice and Edgar must then endure the pain of watching his father die. Goneril and Regan both die, but it is important to note that Goneril kills her sister in a fit of jealousy and then kills herself. Neither is ever brought to justice, to face up to and account for their crimes. PARAGRAPH 7: Still discussing our final impressions. Is it possible then to argue that divine justice succeeds where societal justice fails? In the play some of the good characters reveal a belief that God will punish wicked deeds and reward decent ones – Edgar at one point in the play proclaims that “the God’s are just and of our pleasant vices make instruments to plague us, the dark and vicious place where thee he got has cost him his eyes”. He suggests that Gloucester needs to be punished because he committed adultery and fathered an illegitimate child. However, if this were true then we would also expect the good characters to be protected by God and Albany reveals this very belief when he says of Cordelia “the Gods defend her” but almost immediately after he utters these words Lear appears howling with grief, holding the dead Cordelia in his arms. Surely Shakespeare is making a mockery of the idea of a just God. We find ourselves more inclined to side with Gloucester’s view that there is no such thing as divine mercy or justice when he proclaims “as flies to wanton boys are we to the Gods / they kill us for their sport”. Conclusion: Sum up your main points but try not to repeat the same phrasing. Thus we see that justice and corruption are central themes in the play King Lear. Sadly those characters who believe in societal and divine justice endure the most suffering and hardship in the play. Although they achieve a measure of redemption, by the time Lear and Gloucester realise the importance of offering a just and fair trial to those accused of wrongdoing, their society is being run by their corrupt and evil children who do not believe in justice.. Despite their religious faith, the Gods do not intervene to save Cordelia and ultimately our final impression is that justice has failed and that we are left with a “cheerless, dark and deadly” society where pervasive corruption can be tackled but never fully destroyed. NOTE:Essays are built from paragraphs. Paragraphs are built around concepts and ideas. Paragraph 1 / Concept 1: Lear is tired of being responsible for ensuring his kingdom is fair and just – but why should Lear have the status and privilege of being King if he is not also going to do the hard work? Surley it’s an injustice if others do the work and you get the rewards? Paragraph 2 / Concept 2: Early in the play, 2 serious miscarriages of justice occur: Kent is banished for speaking the truth, Edgar is declared guilty of plotting murder with no evidence and no trial. Paragraph 3 / Concept 3: Goneril & Regan’s punishments are far in excess of the ‘crimes’ committed – once Lear is at the receiving end of such injustice, he begins to realise that he could have been a better King, ensuring social justice for the poor. Paragraph 4 / Concept 4: Edmund wants justice for his mistreatment but he doesn’t care who he hurts to get what he wants – this is not justice but the worst kind of Machiavellian scheming. Paragraph 5 / Concept 5: 2 trials occur, both mockeries of true justice, both proving that true justice cannot exist in a society as corrupt as this. Paragraph 6 / Concept 6: At the end of the play, as all of the corrupt characters die, but it is revenge, not justice, which dominates in these final scenes. Paragraph 7 / Concept 7: Even divine justice fails – so if we’re waiting around for God to reward the good and punish the wicked, we’ll we waiting a very long time indeed!!! Whenever you have to build an essay from scratch, ask yourself what core concepts each paragraph will contain – once you’re figured this out, the rest is a whole lot easier. You can also do this if you’re reading notes or sample essays – extract, and in your own words outline what the core concept at the heart of each paragraph is. Doing this is an intelligent way of studying. Trying to learn off entire essays is plagiarism – it’s a waste of your brain power – it won’t deepen your understanding – and it won’t be rewarded because you have to adapt whatever knowledge you have to answer the question asked. Thank you sooooooo much.marvellous post.It is very useful to achieve good marked in my literature exam.Again & again thank you very much.